My immediate impression (you could call it cultural shock) of the Niger Delta was that of a territory under some sort of siege. The heavy military and police presence right from the point of entry, the Port Harcourt International Airport, through the 35km drive to the centre of the city, and indeed all over the city was mind-blowing, to say the least. The same awesome security forces presence was the same in Bayelsa State and the little I saw of the Rivers State. Coming from Ghana (as a member of the Revenue Watch International team of journalists on a fieldtrip to the Delta), my only memory of such massive and open military presence was of the late 1960s through the early 1980s when military adventurism in Ghana, manifesting in coups, counter-coups and pseudo-revolutions retarded the smooth development of the country. Tellingly, the overwhelming security, as I discovered later, was primarily to protect oil facilities and the foreign operators of the oil fields, as well as wealthy local politicians. Thus what also registered immediately in my mind was of a people divided against itself; an affluent and powerful few against the greater majority of marginalized and disoriented people. And indeed severe poverty stares you in the face in the rural communities along the way from the airport, just as in any other sub Saharan African country that does not earn a fraction of what Nigeria makes from oil. Conversations we had with civil society organizations (obviously operating under difficult and dangerous conditions compared to the situation in Ghana) and some marginalized communities in the oil-producing Ogbia Kingdom including conflict-ravaged Oruma, as well as Etiema in the creeks, established that oil wealth was deliberately and negligently not channelled into the development of the oil-producing communities. “The Federal government, which by law owns all mineral resources, takes all revenues from oil but wilfully shirks its responsibility to the Niger Delta,” said Constance Meju of the National Point newspaper. “Federal, State and local government officials all have colluded with oil companies to perpetuate a system of divide-and-rule as a means of controlling the host communities. “Traditional authorities and local opinion leaders have also, out of greed, negotiated with government and the oil companies to satisfy their personal and parochial interests rather than the needs of the communities,” Meju added. Civil society organisations disclosed that, up to date, there is no way of ascertaining the exact volumes of crude exports, though officially Nigeria is known to produce over two million barrels daily. This situation, they said, makes it difficult to know how much of oil revenue is being looted by government officials. Discourse in the local media, both electronic and print, confirmed my first-impressions of the Niger Delta as a land under siege. Consistently, discussions are about how to utilize oil revenue to empower the larger population as a means of diffusing the tension within the society. There seems to be a tacit consensus that enforcement to create a semblance of order, by a massive deployment of the state security apparatus, rather than economically empowering communities through investments in critical infrastructure is unsustainable in the long-run. There are a few straight lessons in here for Ghana, an emerging oil economy that delivered its first light sweet crude on the international market in January this year, from its 120,000bopd Jubilee Field. Under no circumstance must the volumes of oil produced and exported from Ghana be shrouded in ambiguity, since as in the Nigerian case, it allows for individuals in collusion with the oil companies, to enrich themselves at the expense of the State. A case in point is the current issue about the Jubilee field export meter allegedly disrupting communications processes of field operator, Tullow Oil, and for which reason the meter has been disabled thereby making it impossible for officials to exactly ascertain how much of oil is being offloaded onto tankers for exports; while Tullow Oil also claims that it has space for only one Ghana Revenue Authority official on the production vessel, whereas the ideal number is two. Another lesson is that a significant proportion of oil revenues must consciously be channelled into the local economy of the oil producing communities. Critical infrastructure development, such as in roads and educational facilities must be pursued vigorously, while traditional economic activities including farming and fishing is supported to be more profitable so as to dampen the misplaced expectations of the people that they stand to make more money from directly operating in the oil sector. Immediately Ghana must be looking at mechanisms that allow for efficient utilisation of oil revenues in development projects in the host communities, which minimizes opportunity for corruption by national and local government officials, as well as by traditional authorities and local opinion leaders. 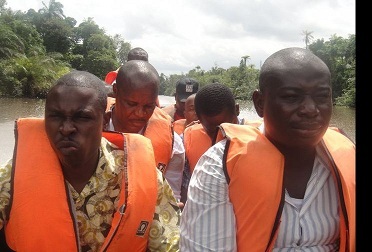 A system that seems to be working well in the Niger Delta, currently is what has been termed the Global Memorandum of Understanding, which matches funding from the oil companies and government to the development needs of the communities, and which are then managed as a commercial enterprise with strong involvement by the local community. In that regard, the Ghanaian oil communities should immediately be engaged to help them clearly define their interests and also to identify their most pressing needs so as to efficiently utilise what oil revenues would be available to them. This admittedly will involve a lot of effort and time, but it certainly will yield higher and sustainable long-term dividends, which obviously should be more preferable to the siege situation that presently pertains in the Niger Delta.